A new study has shown that anoles (Anolis evermanni), a tropical tree-dwelling lizard found in Puerto Rico, are surprisingly good problem-solvers who have cognitive abilities that rival those of birds known for their highly flexible behaviors. Manual Leal, a professor at Duke University, led a study in which six anoles were given a series of challenges designed to test their behavior flexibility, cognitive abilities and memory. In these experiments, the lizards were presented with a platform containing two wells, one containing a food reward and the other empty. The wells were covered with tight-fitting opaque discs of differing colors and patterns, and the lizards were given 15 minutes to obtain the reward. The correct response required major changes to what has previously been considered highly stereotyped foraging behavior, which consists of scanning the environment for moving prey items and striking them from above. In our experiment, motion cues were absent and striking from above was ineffective at dislodging the disc. Lizards used multiple strategies to remove the disc. The first was a modified strike, laterally biting the disc and lifting it away from the reward. The second strategy required the lizard to advance on the disc with its head held against the substrate, using its snout as a lever to push the disc out of the way…. This strategy is not a natural foraging behaviour that has at least been witnessed, and may demonstrate an entirely novel solution, which is one of the main criteria used to recognize behavioural flexibility. 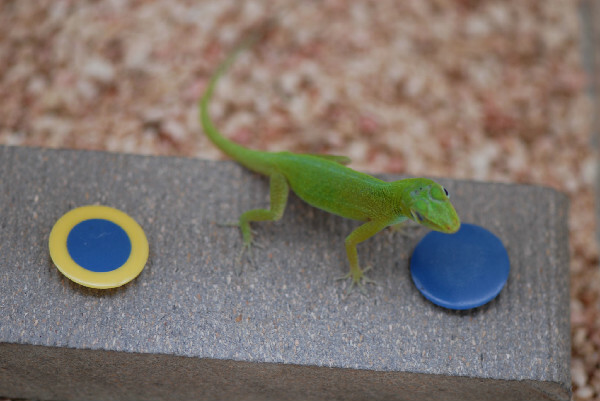 When the tests were repeated with the disc colors associated with the reward reversed, two of the lizards continued to flip the original disc in an unsuccessful search for the reward, but the remaining two, nicknamed Plato and Socrates by Leal’s team, figured out that the discs had been changed and solved the problem again, reversing their previously learned color associations. (This sort of test is known as a “reversal learning” test.) Although there haven’t been many studies of cognition in reptiles, Plato and Socrates’ success appears to be particularly notable since prior evidence had suggested that reptiles do better at solving puzzles involving location change than ones involving altered visual cues. Finally, Leal and his team were surprised to discover that the anoles were able to solve the challenges presented in these experiments in only one-third the attempts needed by birds given similar tasks in comparable experiments. While the researchers did not draw any definitive conclusions about this, they did note that, due to the slower metabolisms of the cold-blooded anoles, they could be tested only one time a day, and that the tempo at which the tests were performed might have some bearing on the number of attempts required. Perhaps because people don’t expect displays of cognitive flexibility in reptiles, Leal’s research has generated a fair bit of media attention, including articles in The Economist3, ScienceNOW4, MSNBC5, BBC Nature News6 and LiveScience7. Enjoy! Now, after a long week, I think I’m going to go out and lie on a warm rock and then get some dinner. 1Leal M, & Powell BJ (2011). Behavioural flexibility and problem-solving in a tropical lizard. Biology letters PMID: 21752816. 2New Scientist, “Smart lizard solves a problem it’s never seen before,” July 13, 2011. 3The Economist, “Cold Blooded Cunning,” July 14, 2011. 4ScienceNOW, “Tropical Lizards Get Brainy,” July 12, 2011. 5MSNBC, “Don’t underestimate the brainpower of a lizard,” July 13, 2011. 6BBC Nature News, “Lizard has problem solving skills,” July 13, 2011. 7LiveScience, “Lizards Are Wizards At Solving Food Puzzle,” July 12, 2011.